Here at Top Gamble we have listed the latest Microgaming Games available Online. Read Below on short reviews of our choice of popular Online Slots. Get help from some mischievous monkeys in order to win a ton of rewards in this stunning Queen of the Jungle Video Slot. 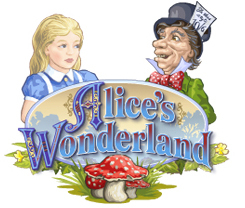 This slot game includes 5 reels and 9 paylines with rewards up to 30 000.00. This game is packed full of Free Spins, scatters, Wilds, Multipliers and of course three different bonus games! Play the game at Mr Green Casino today!! The original ThunderStruck slot game is very popular among online slots players so you can expect ThunderStruck II to become just as popular. Sounds are Graphics are superb and keep the player coming back for more. This game of Thundersruck has 243 paylines, four different free spin bonus rounds, 25 free spins as well as a random wildstorm feature. In Lady in Red Slot Players will become a part of the lights and camera flashes of the paparazzi. You can enjoy up to 25 retriggering free spins where all wins are tripled. The wild symbols is the lady herself and she enables players in building winning combinations where winnings are doubled. Lady in Red is a 5 reel, 25 payline slot game where a max bet of 50.00 wins of up to 25 000.00 are achievable in the base game. This space pirates theme is a 5 reel, 25 pay-line slot, presented with modern 3D styled graphics that show the out-of-this-world fantastic voyages of the colorful Galactic Galleon. It is the unique bonus structure in this game that makes it stand out from the crowd, with a trail of 6 different and diversely rewarding bonuses, each presenting an interactive player experience. This stunning Video Slot contains realistic graphics and original sound effects in this 5 reel, 20 pay-line and multi-featured game. The Mayan Princess has an exotic jungle theme with tempting priestesses, courageous warriors and wild animals. This all makes up this exciting and distinct game which contains a maxi bet of 40.00. Sail the seven seas aboard the good ship Endfeather alongside Captain Chook! The Lucky Eggsplorer theme is cartoon-like full of new featured games which are based on the explorative voyages of a rooster named Chook. Keep an eye out for winning Scatter and Wild combinations and rewards full of multipliers, free spins and a gamble feature that can double or quadruple your winnings.